A beautiful clear day it was, todays image sees us looking out over the lower part of the city, across to Devonport on the North Shore, and beyond that Rangitoto Island (also a different part of the country way past that). Rangitoto, a volcanic island, stands out in the Auckland landscape as the island that looks almost the same from any angle of Auckland. Its name, Maori, translates to Bloody Sky. Estimated to have largely formed 550-600 years ago (although possibly also over 1000 years intermittently). This recent forming (in the grand scheme of things), lives in the memory of local Maori, and evidence of human footprints between Rangitoto and its adjoining island Motutapu have been found. Move forward a few hundred years from its creation, and into European settlement time, Rangitoto was purchased for the grand sum of 15pounds by the crown in 1854, and by the late 1800’s had become a popular day trip location (and a growing batch/alternative community). Further building was banned in the late 1830’s, and today only a small number of houses remain in this park area. A great place to visit while one stays in Auckland – if you do go, remember to take a water bottle with you. Naturally sparse in water supply, walking up the volcanic path to the summit (unless you get the tractor) the climate is often hot and dry. That concludes my wider views from the Sky Tower for now. 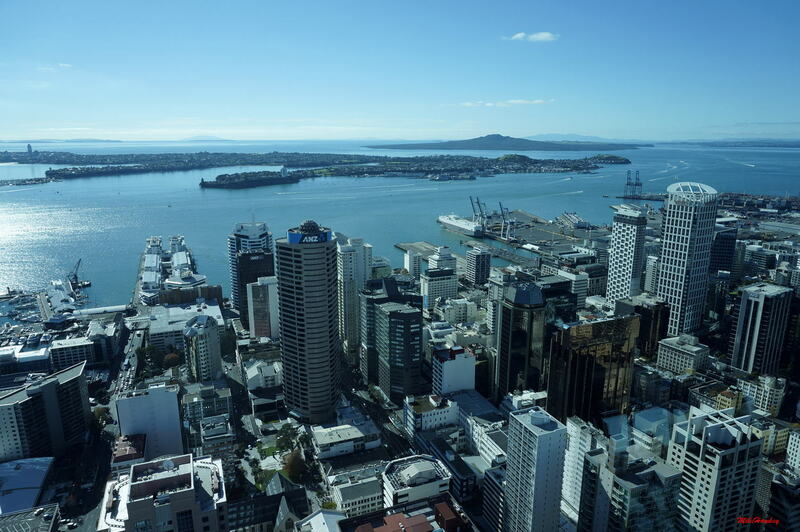 Really a must do for visitors to Auckland – simply to soak in the views of the countries largest city. Do you happen to know if the Maori keep up with their language or is it a nearly forgotten language like Hawaiian? Good question. Maori is New Zealands second official language (actually, sign language is our third, but many dont realise). Back 30-40 years ago it probably hit its low point (at one stage Maori children would get in trouble at school for speaking in Maori), but in the last few decades Maori has grown strongly again. Our only 100% government funded tv station is produced in Maori, and some of the more general greetings etc. are spoken widely. There are a few Maori only spoken schools around also. Very glad to hear that news.